Caption: Depressed patients with higher activity in the anterior insula (where the green lines intersect) did better with medication than cognitive behavior therapy. Today, figuring out who will benefit from which antidepressant medication is hit or miss—physicians prescribe a medication to treat major depression for two to three months, and then gauge the results. This trial and error is frustrating and expensive; typically only about 40% get well after this first treatment or see an improvement in symptoms. The other 60% must try a different drug or some other approach. In a new NIH funded study, researchers showed how brain scans could predict which individuals would benefit from a medication and which might respond better to psychotherapy . The researchers measured resting brain activity in 63 patients suffering from depression using a brain scanning technique called positron emission tomography (PET). PET measures how much glucose—brain fuel—various regions of the brain are consuming as a proxy to measure which areas are most active. After the scans, patients either received 12 weeks of an antidepressant medication or 12 weeks of cognitive behavior therapy (CBT). 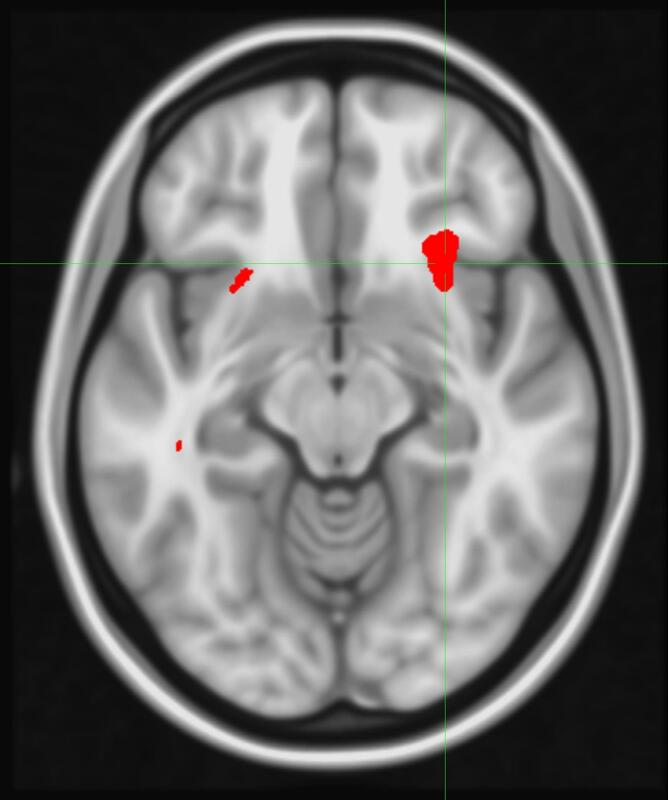 The researchers found that activity levels in a brain region called the anterior insula—known to play a role in emotion, self-awareness, and decision-making—was associated with whether an individual would benefit from CBT vs. escitalopram, a common antidepressant that alters the level of certain chemical messengers in the brain. In general, those patients with low activity in their anterior insula responded well to CBT, but not to medication. Those with hyperactivity in this region had better results with the medication, with depression going into remission. Conversely, CBT wasn’t as effective in this group. Before scans like these can be used for patients, we need to repeat the studies and trials to make sure that the findings hold true. Discovering a reliable biomarker to guide clinical decisions could personalize the treatment of depression, which currently affects almost 7% of Americans . Developing better treatments is critical because depression can be a very serious illness. Depression increases risk of suicide and affects every facet of life: work, sleep, study, eating, and the enjoyment of activities an individual once found pleasurable. Choosing the best treatment the first time around would reduce patient distress and decrease the enormous healthcare costs and economic burden caused by this disease. As we learn more about the brain through endeavors like the BRAIN Initiative, I expect we’ll discover “brain types” that may eventually help physicians personalize treatments—not just for depression, but for many illnesses that affect the brain. Awe-inspiring post, Dr. Collins! This is fantastic! Let’s hope replication studies will be done. One implication I fear may come from the personalized treatment of depression through neuroimaging is that HMOs might use the results to discriminate between who gets to see the psychiatrist. For instance, those who respond best to CBT might be referred to a psychologist in order to preserve the standard 15 minute sessions psychiatrists have with their patients — which is only long enough to do medication management. And, the general fear of psychiatrists is that as their field becomes more scientifically sophisticated, it will become less humanistic and personal. …But, if HMOs aren’t so concerned with greed, maybe they’ll allow psychiatrists more time with those patients who respond best to medication? Does everyone with depression not fall into the “middle ground” area between responding best to medication and responding best to CBT? This is very encouraging to read about, Dr. Collins! I’m so glad that studies like these are being conducted, and that actual progress is being made toward a medical understanding of the treatment of depression. It really does relieve much anxiety I experience to know that advances like this are being made because of the BRAIN initiative, and that further studies are likely to be done to ensure that the results are true. Thanks for posting this, and for all you do at NIH, sir! This potential treatment selection biomarker would not eliminate the critical initial diagnostic evaluation and overall consideration of the depression in a patient’s overall medical and health profile, a process optimally managed by a patient’s physician. Tests are but one component of a comprehensive treatment plan. One would anticipate continued oversight by a patient’s psychiatrist as depression is often a recurrent condition for many patients and treatment selection in subsequent episodes may require different strategies. What was very interesting to our research team was the absence of a scan pattern that was common to both the CBT and medication responders. This suggests that there may not be a generic depression ‘type’ that could be treated with either approach and do equally well. This emphasizes the importance of full characterization of these depression subtypes so that treatment can be optimized for each person as is done for cancer and infectious disease. The PET scanning approach is a first step in what will hopefully be a comprehensive evidence based approach to the treatment of depression and other psychiatric disorders at all stages of illness. What happens in human body and brain falling into major depression? These studies are needed and it is good to see that they are being conducted. The results of PET are very interesting. thanks for the information.